Suzanne Walsh focuses her practice in defense litigation with particular emphasis on product liability claims. She represents manufacturers, suppliers and distributors in state and federal courts throughout the United States. 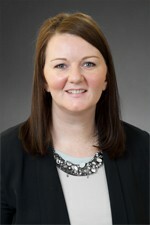 Ms. Walsh is involved in all phases of the litigation process, and has defended domestic and international clients against allegations of manufacturing and design defects, strict liability and breach of warranty claims. Ms. Walsh has successfully resolved cases through settlement negotiations, pre-trial settlement conferences, as well as mediation. Prior to joining Hinshaw & Culbertson LLP in January 2017, Ms. Walsh practiced product liability defense in a firm in White Plains, New York. Before that, she began her practice representing clients in real estate matters at a New York firm where she also worked as a paralegal prior to law school. Ms. Walsh's law school accomplishments include having been a recipient of the Trustee Scholarship. She participated in the VIS International Arbitration Moot Court in Vienna, Austria, and was an International Associate for the Center for International Law. Ms. Walsh devotes a portion of her practice to the Safe Passage Project where she is a volunteer attorney providing pro bono counsel for undocumented children facing deportation.